With Free-to-Play going live later this month, Lead Designer Damion Schubert posted a Developer Update discussing what players should expect when Game Update 1.5 and FTP goes live. As a follow up forumpost by Joveth Gonzalez, it’s pointed out that Schubert’s blog post was written a few weeks ago, so if it reads that way, that’s why. The point of the blog still stands though, and assures that people who are subscribers now, won’t lose anything if they stay subbed when FTP launches. A thing that stands out in the article is that the minimum purchase from the web store needed to become a Preferred Status Player is $4.99. 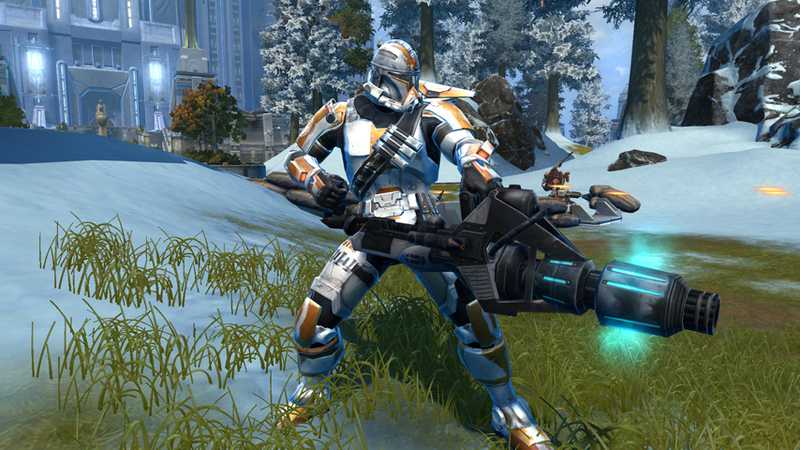 Our scheduled launch for the Free-to-Play option for Star Wars™: the Old Republic™ is approaching quickly. The team developing this option has been working hard to hit this date, and as I write this, we have an alpha version of the complete experience up and running, and have been running extensive play tests of the experience. Early feedback has been extremely positive; from both die-hard Star Wars: The Old Republic fans as well as players who have never played the game before. We are now deep into a polish phase, working on bringing the complete experience up to the high quality level that our customers expect from a BioWare game.As the Lead Designer of the team that has been working on the new Free-to-Play option, our goal is to bring to you the best possible experience. We started this process several months ago, and since then we have been led by two core philosophies that are crucial to how we view and think about such a large design shift. The first core rule is that we want to be sure that players can reach level 50 without paying a cent, if so desired. The final design meets this requirement: Free-to-Play players can play levels 1 through 50 and enjoy the vast majority of the classic storyline and side quests during their journey. A member of our Marketing team once observed that Star Wars: The Old Republic is roughly 24 times the size of the original Star Wars™: Knights of the Old Republic™ game. Well, now BioWare is letting players have all that story content for free! That’s not to say there won’t be restrictions – Free-to-Play players will earn experience more slowly, for example, and several aspects of the gameplay experience are limited. If you have friends who love Star Wars™ and the BioWare-style storytelling, but were uneasy about the monthly subscription, or paying $60 up front for the box – well, come mid-November, those concerns should be erased. The second core rule is that subscribers should not experience any degradation of their gameplay experience. Those of you who are still paying a monthly fee should still get the same gameplay experience and you won’t find anything taken away from you and the gameplay that you currently enjoy. Furthermore, we really wanted to be sure that in no way would subscribers feel they needed to make purchases from the Cartel Market in order to be competitive in the game. We not only met these goals, in my opinion, but exceeded expectations – subscribers will enjoy new benefits from the update, including two more quick slot bars, a new purchasable Cargo Hold tab, and a monthly grant of Complimentary Cartel Coins to spend however they like in the Cartel Market. Subscribers can also buy the same experience boosts available in the Cartel Market as Free-to-Play players, which allow characters to advance at a rapid pace. We highly value all of our players and it is important for us to ensure that our players recognize the value offered in both the subscription and Free-to-Play option. We also felt it was very important to thank our subscribers for being members of The Old Republic community. To reward all of you, we will grant Complimentary Cartel Coins to every player who has been a subscriber prior to the launch of the Free-To-Play option. The actual size of the grant will depend on how many months you were a paying subscriber prior to our announcement and after our announcement. There will also be special grants to those who purchased the Star Wars: The Old Republic Collector’s Edition and Digital Deluxe Edition. Want to know how many Complimentary Cartel Coins you have earned? Click here to find out! We are literally granting millions of dollars worth of Complimentary Cartel Coins as part of this program. But you’ll only receive a grant of Complimentary Cartel Coins if you’re an active subscriber when the Free-to-Play option goes live! Look for more ideas of what Cartel Coins can purchase in coming weeks! Here’s a hint: fans of vehicles and pets will not be disappointed. Also, there will be a wealth of equipment that will be fully moddable, adaptive in weight and have no class restrictions, giving players wildly new directions in which to customize their appearance. And we have not forgotten about those of you who once had accounts, but cancelled. We are hoping to get you to come back and play!Any player who has ever paid a monthly subscription fee will be given Preferred Status automatically when Free-to-Play option is launched. Players with Preferred Status do not face the same limitations as a Free-to-Play player and will find that some restrictions are either removed or greatly reduced. In addition, Preferred Status can be earned by any Free-to-Play player who spends a minimum of $4.99 at our web store. The team has been hard at work developing the Free-to-Play option. We feel like the Free-to-Play option will be a huge boost for both the game and the community by giving more fans access to the game. Star Wars: The Old Republic is a fantastic game and a top-tier MMO. We are looking forward to welcoming all of the new fans! We appreciate your support!